Mondays seem to be my longest day of the week! I left my house just before 8:30am and didn’t get home till just before 10pm! I did take a quick 20 minute trip back after work to change clothes for Zumba, but phew! I’m zonked! I thought it would be best to share this fabulous soup because I really enjoyed the flavors and am already looking forward to making it again. 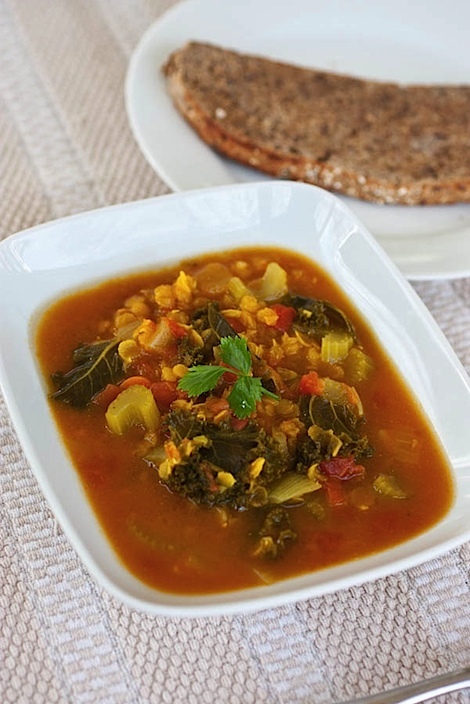 This Spiced Red Lentil, Tomato, and Kale soup is easy, fast, filling, and tasty! Plus the fun spices are a great change up from the boring usual soup rotation. 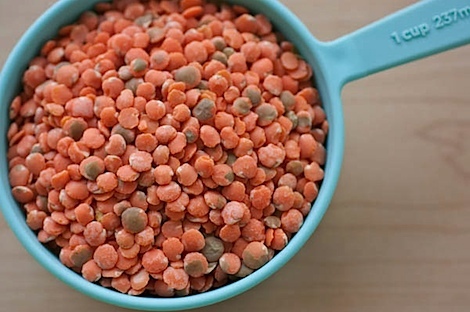 Red lentils are the star ingredient. I chose them because they cook faster than other lentil varieties and I wanted lunch FAST one day. I also added some kale to the soup for extra nutrition and texture. 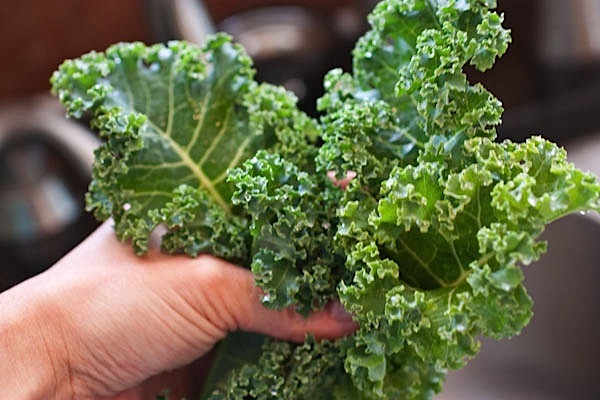 I love greens in soups, but I find kale is especially good in soups because its texture is a bit more firm then, say, spinach. This easy but deliciously flavorful soup whips up quickly. I love how the lentils keep you full, while the vegetables fill out the rest of the soup. I also enjoy how the flavor is so different then some other soup classics. Make this the next time you want a new, healthy soup fast. It freezes well, too, so you can enjoy it again later. Serve with some hearty, whole grain toast to complete the meal. Pre-heat a medium-large pot to medium heat. Add extra virgin olive oil. Add onion, celery, and carrots, sprinkle with a pinch of salt and cook till tender, about 4-5 minutes. Add garlic and cook 60 seconds or until fragrant. Add tomatoes, lentils, broth/stock and bring to a boil. Add kale, cumin, turmeric, mustard, salt. Reduce heat to simmer and cook 25 minutes. Don’t you just love the bright color of the soup!? This soup looks sooo good! Perfect comforting healthy winter meal :). That is definitely a gorgeous bowl of soup! Soup makes my heart warm! this looks awesome! I am always trying to find ways to use more lentils in my cooking. Soup seems to be the best option. Mmm that looks so filling and healthy. I love adding kale to soups- I feel like it’s a green that gets such a bad rap, but it’s filling, and cooked right it adds so much to a dish! I agree about the texture of kale in soups. Spinach just ends up as a sloppy mess that’s kind of gross to eat, but kale retains some firmness, which I like! Exactly! 😉 I can do spinach if it’s chopped very small (like frozen chopped spinach, which is great to toss into soups) and therefore doesn’t really have a texture or if it’s going to be eaten right away and not re-heated later. This looks amazing!!!!! I love me some soup in the winter, and this looks so cozy! I love when there are colorful soups! It just melts my heart and hopefully all the snow that is going to overtake my house! I’m making this soup next week! 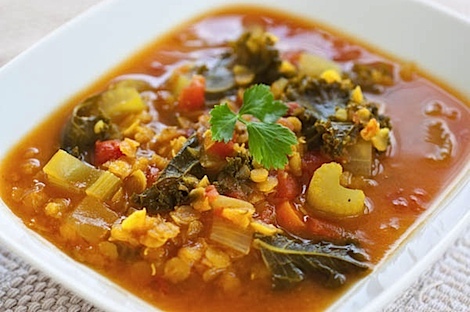 I love lentil soups, yum. the soup looks ahhmazzing! I want lentils. I made this soup this afternoon, after buying kale at the farmers market. It was quick, easy and delicious! I also used your kale chips recipe with the leftover kale. Thanks for sharing!